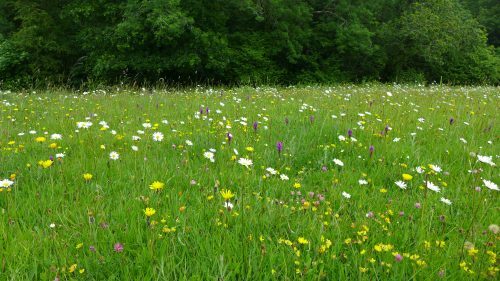 Four acres of species-rich meadows at Buckland-in-the-Moor that were just waiting for a change in the management in order to reveal their natural treasures. We bought two small fields in 1990. They had been fertilised and grazed by dairy young stock by the previous owner. The fertility was always low due to thin top soil on a steep slope. One field is on a steep southeast-facing slope and the other is shaded by tall hedges and a wood with a stream along one boundary. 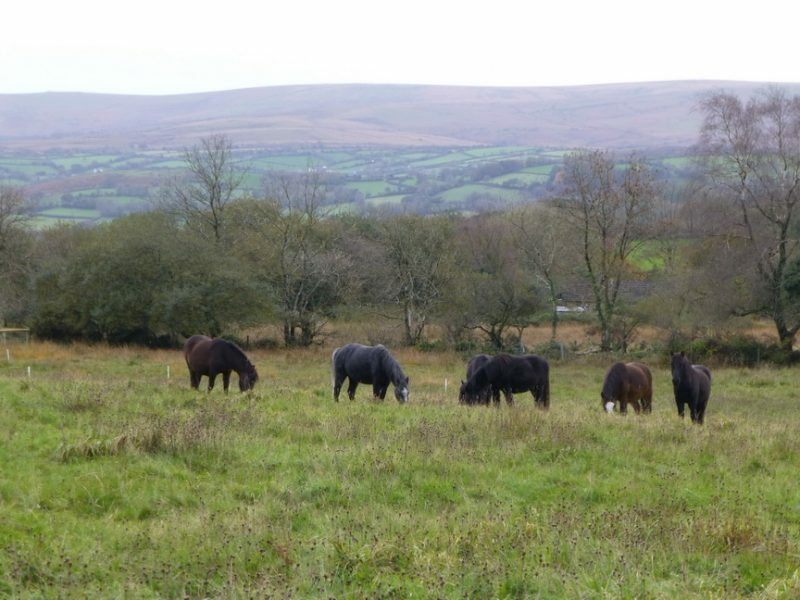 We ceased all fertilising of the fields when we bought them and they were then grazed intensively for 15 years by two ponies, during which time the fertility reduced considerably. Then for the past 12 years there has been only one non-native pony who does not like orchids and prefers grass to wild flowers, so the pastures have evolved an incredible diversity of plants and fungi all presumably dormant or spread by wind/birds as we have not introduced any plants, seeds or hay. 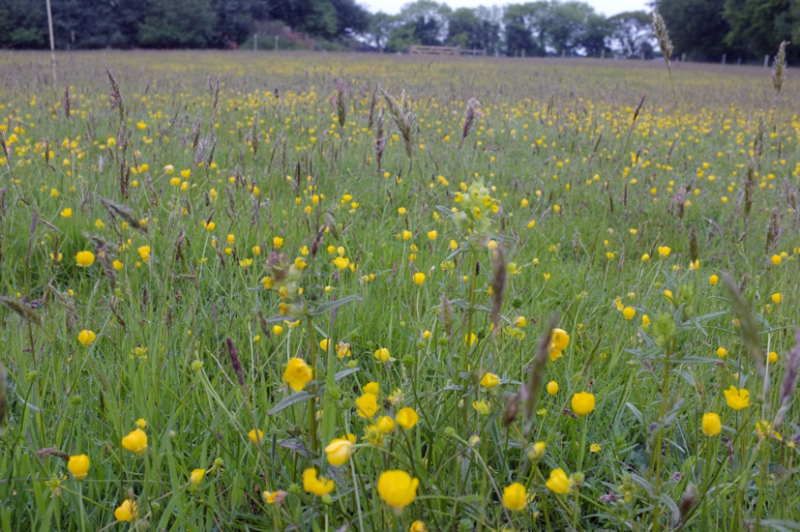 The main wild flower field is grazed from mid-August to mid-September by up to eight South Devon cows, and then by our pony Jack till mid December. 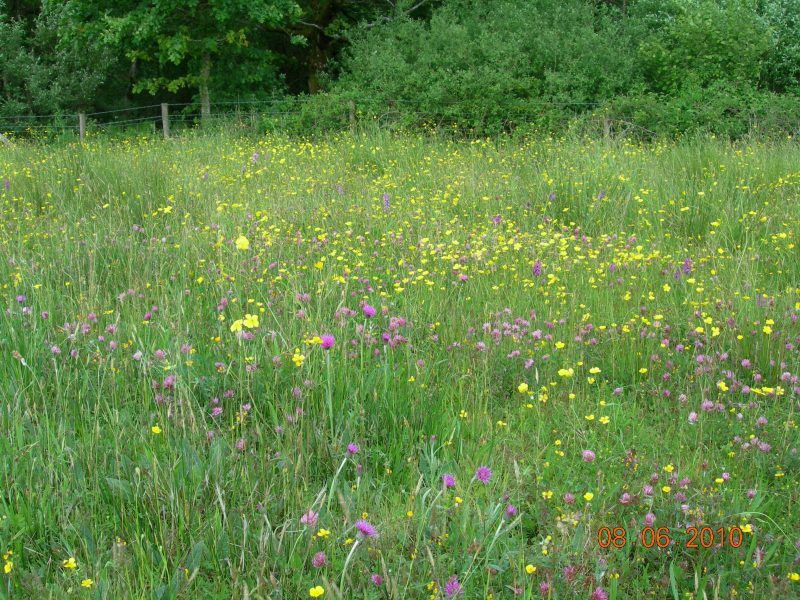 The smaller field is grazed from April through to September by Jack so there is not the range or quantity of flowers in this field. Selective areas of encroaching bracken and bramble are topped with tractor mower in July/August and if necessary both pastures are completely topped in September. 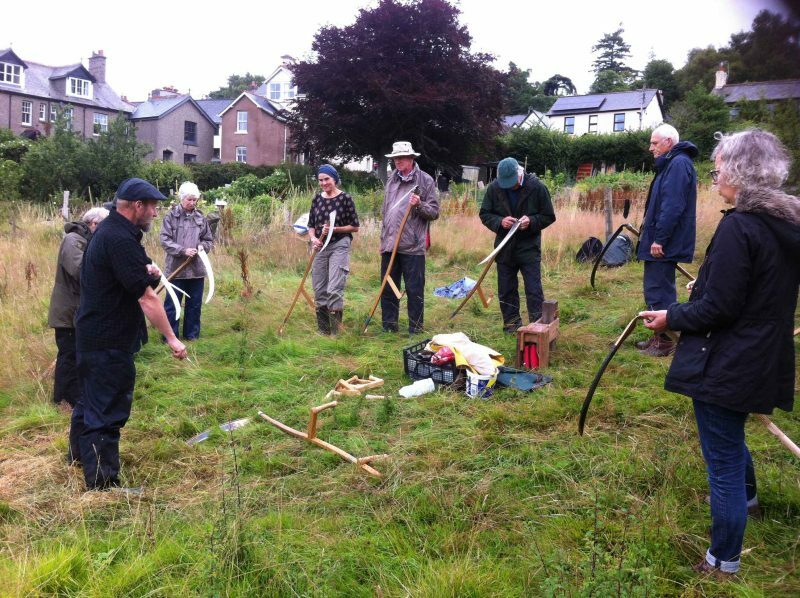 We plan to continue to experiment with more topping in selected areas during the butterfly orchid flowering period to deal with increasing bracken and bramble on the steeper slope. 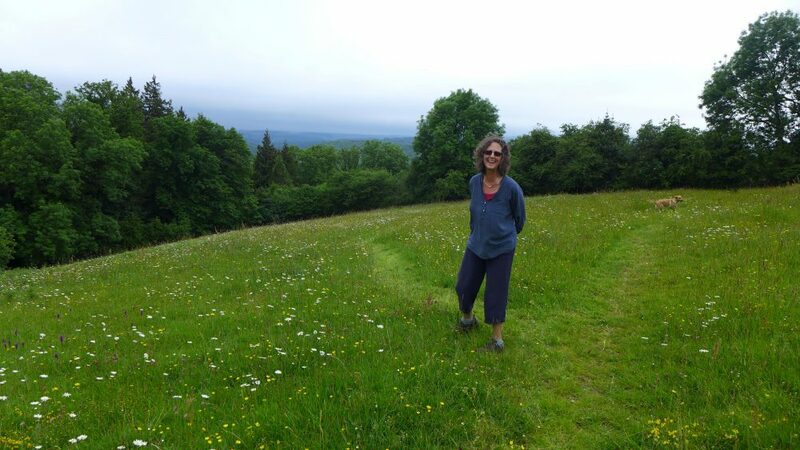 Walking in the fields every day is a chance to observe the extraordinary growth, flowering and seeding of all the plants – quite magical as the profusion of flowers, meadow grasses and fungi increases each season. Bluebell, Birdseye speedwell, Birds foot trefoil, Bugle, Celandine, Centaury, Common catsear, Common mouse ear, Common sorrel, Common yellow trefoil, Corky fruited water dropwort (new arrival in 2017), Cuckoo flower, Daisy, Dandelion , Dog violet, Early purple orchid , Fleabane, Golden saxifrage, Greater butterfly orchid, Greater hawkbit, Greater stitchwort, Ground ivy, Hemp agrimony, Hogweed, Hawks beard, Knapweed (hardhead), Lesser hawkbit, Lesser stitchwort, Marsh thistle, Meadow buttercup, Ox-eye daisy, Pignut, Pink purslane, Ragged robin, Ragwort, Red campion, Red clover, Ribwort plantain, Selfheal , Snowdrop, Southern marsh orchid, Spearwort, Spotted marsh orchid, Spring sedge , Star of Bethlehem, Tormentil , Valerian, Water mint , White clover, Yarrow, Yellow rattle, Yellow vetchling. Agrostis, Cocksfoot, Crested dogstail, Meadow grasses, Meadow fox tail, Perennial, Rye grass, Sweet vernal, Yorkshire fog. Bracken, Bramble, Creeping buttercup , Dock, Hemlock water dropwort.